The food security situation for this period remained unchanged in compared to last year and last reporting period. All VDCs and municipality remained minimally food insecure due to the harvest of maize, paddy, millet and summer potato(only in cluster B vdcs). Most of the households have food stock available for more than 4 months. Continued income from selling vegetables(Cauli Flower,bean, cucumber, raddish), livestock products(goat meat, milk, poultry) and sufficient wage labour opportunities had supported to improve the access of food to the people. For instance, a total of 430 million rupees revenue generated from sale of agricultural crop including vegetables, 201 million rupees from summer potato. Similarly, an appro, of Nrs. 1200.32 crore revenue generated from sale of livestock/livestock products. In this monitoring period 390 million rupees cash remittance inflow from different sources. 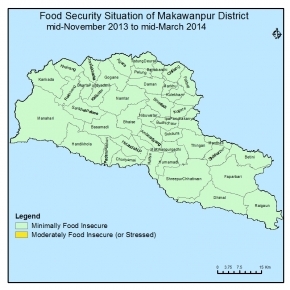 7.54% HH(3221 people(396 HH) out of 30,714 population in western part of Makwanpur are moderately Food Insecure during this period due to limited HH stock,Limited income opportunity and increasing coping strategy.All markets remained well functioning with sufficient food supply. Security situation remained generally peaceful. The food security situation is likely to remain the same(minimally food insecure) in the next reporting period. Currently harvested paddy and millet will be sufficient for next 4 months. Wheat will be harvested; sufficient food stock will be available in the markets for 2-3 months; sale of agri products(winter potato & other vegetables) and livestock products will continue. Similary, sale of TFPs in cluster B and C will continue. Agricultural wage opportunities will be available, remittance inflow is likely to continue at expected normal level. Most of the chepang population will remain Minimally Food Insecure but approximately 20% population will be Moderately food Insecure.Market will be fully functioning with uninterrupted food supply. No natural disasters, calamities and civil unrest is expected.